From the innovative minds of Piedmont Cartridge comes the industry's newest and highest quality fully integrated suppressed rifle system. Built on the values of being rugged, trustworthy, and dependable, the Catahoula rifle system is guaranteed to offer superior performance in even the most adverse conditions. Constructed with a 10” barrel and a full titanium suppressor that has an overall length of 16”. 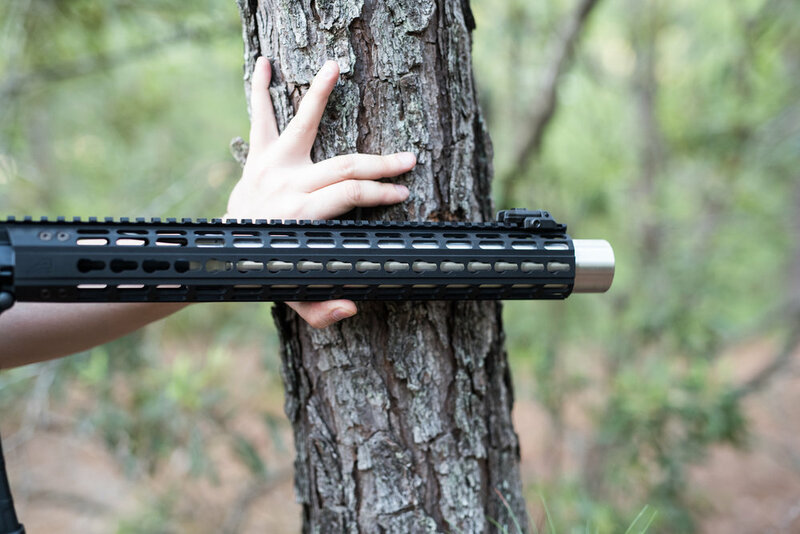 This creates a complete rifle system that is not considered a short barreled rifle. One stamp, one solution! The suppressor has 2 attachment points to the barrel and a locking end cap that provides the strongest possible connection to the barrel. The custom titanium gas block has two additional set screws to lock it in place. The titanium suppressor is extremely light-weight and extremely durable. The outer case is removable to access the baffle for cleaning. This upper has been tuned to run light or heavy .300 blackout subsonic rounds. It comes with a PRI Gas Buster charging handle, a Nickel Boron Bolt, one a Lancer L5 AWM magazine, and a 15 inch M-Loc Hand Guard with a standard Picatinny rail on top. Even when fired in full auto a muzzle brake is not required. Just like the breed they are named after, these rifles are rugged, trustworthy, and most of all dependable. Get yours today! Gen 2 Lower Receiver with Flared Magwell.